London is a city that never sleeps! Thus, many excitements are present on its streets. This time, Londoners were caught staring and admiring this luxury beast called Veneno! 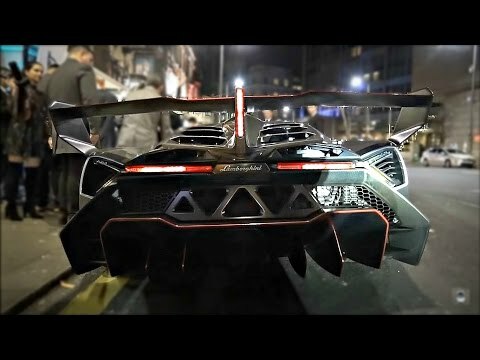 Brand new Lamborghini Veneno was the center of attention in London after it performed and showed what it can do! The sound of this one was mesmerizing! And how would it not be when this baby is equipped with an engine being able to boost 750 HP. This vehicle is limited to 220 mph as it is able to accelerate from 0 – 62 mph in 2.8 seconds! The new Lamborghini Veneno is worth something over $7.5 million. Based on the Aventador, the Veneno is a prototype. The one you will see in the video below is one of a kind and is the first time to be seen in Britain, yet alone London. Many celebrities were grasped by its performance such as the famous hip hop artist Lethal Bizzle! The Veneno is optimized for some underbody aerodynamics as well as stability to high speeds. Light carbon fiber was also used for the whole cockpit as well as some parts of the headliner and seats. However, check out what grasped Londoners` attention like nothing else lately! Finally, here you can check out the technical modifications of the Lamborghini Veneno.